The EC-135 is intended as a replacement for Eurocopter's successful BO-105 light twin, and is developed from the BO-108 technology demonstrator. The original MBB BO-108 was intended as a high technology helicopter demonstrator, and as such incorporated a range of high technology features including a hingeless main rotor (Sikorsky and Boeing adopted this design for their military RAH-66 Comanche), all composite bearingless tail rotor, shallow transmission (allowing greater cabin height) with special vibration absorbers, composite structures, improved aerodynamics, modern avionics and EFIS instrumentation. The first BO-108 was powered by Allison 250-C20R3 turboshafts and flew on October 15 1988. The success of the BO-108 test program led to MBB's announcement in January 1991 that it would develop a production 108 with Arrius or PW-206 engines as a replacement for the BO-105, with certification planned for 1994 and deliveries in 1995. However the formation of Eurocopter (in January 1992) gave the program access to Aerospatiale's Fenestron shrouded tail rotor technology which was then incorporated into the design. The combination of the BO-108 and the Fenestron led to the definitive EC-135 flying for the first time on February 15 1994. German certification was granted on June 14 1996, while US approval was given on July 31 that year, the same day as the first customer delivery. Thanks to www.Airliners.net for that historical background. 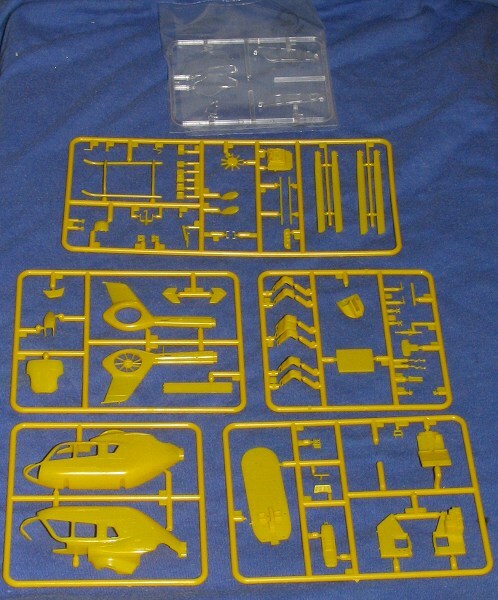 Molded in a bright yellow plastic (undoubtedly to assist with painting) The five standard and one clear sprue are closely packed in one of those 'letter box' packages that seem to have become more and more prevalent over the years. Most of us hate them as it doesn't give us a box to work out of and it makes it easier to lose parts that come adrift from the sprue. Either that happened to me or the part was gone before it was bagged as I'm missing part #12, one of the interior seats. Fortunately, it isn't critical to the build. As one expects from a modern Revell AG kit (this one has a 2001 date on the bo x), the detail level is quite high and for the most part, engraved. There are sink areas in some of the thicker parts, most notably the roots of the rotor blades. There is also a teeny bit of flash on a few parts, but nothing major at all. The instructions call for 10 grams of weight to be hidden in the instrument console. A stretcher is provided for the interior in place of what would be more seats in a corporate version. Instructions are the semi-newsprint version that opens on the top rather than the side. Colors are all in Revell shades, some mixing is required for some of them. Fortunately, a generic name is given so we at least have some idea of what to paint it. It is quite a disturbing trend for model companies to only give references for their own brands, especially as some of these paints are not available everywhere. Markings are for two Auto Club helicopters, both in overall yellow with black trim. 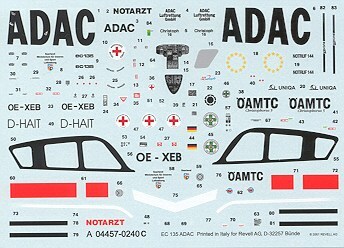 One is for the German Auto Club as is shown on the box art. 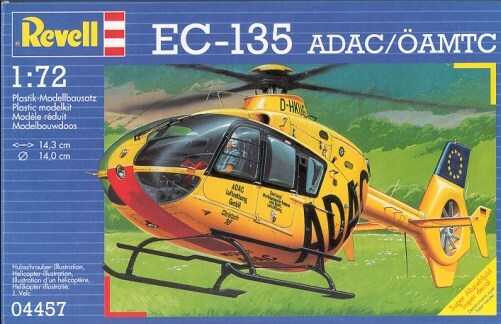 The other is an Austrian Auto Club EC-135 and will have the red/white/red of their flag on the fin. The decals are well printed and quite matte. They include instrument panel decals and some of the black and dayglow red trim so that won't have to be painted. 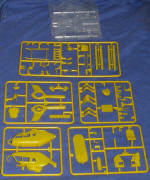 Overall, it is a nice little helo kit. The number of parts may mean that this one won't be the best choice for a beginner, but those of us who like rotary-winged aircraft will want to add this one to our shelves. Kit courtesy of me who bought it because of a decal sheet! If you would like your product reviewed fairly and fairly quickly by a site that has 300,000 visitors a month, please contact me or see other details in the Note to Contributors.